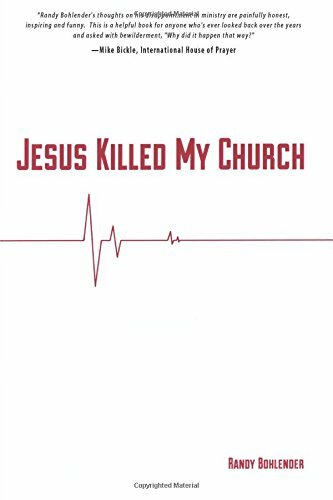 Steve Bremner at The Fire on Your Head podcast pointed out that Randy Bohlender‘s book Jesus Killed My Church was free for Kindle on Amazon, so I bit. Hey, provocative title–and I’d met Randy years before when our paths crossed at Vineyard Community Church in the Springdale area of Cincinnati. The gist of Randy’s book: God leads. Put yourself in a place to hear His Spirit and then go with the flow. Autobiographical and an apologetic for why you need to be baptized in the Holy Spirit, Jesus Killed My Church documents Randy’s and his wife’s first encounter with the Holy Spirit, learning to listen and trust the hearing, and following God along unexpected pathways. They end up at a home for wayward teens in the hinterlands of North Dakota, an old-fashioned Tennessee church, the Brownsville Revival, Burning Man, The Call, and the defunct College Football Hall of Fame in Mason, Ohio, all the while keeping their spiritual eyes and ears attuned to what God had next. In between stops, the Bohlenders get input from folks I’ve broken bread with, Steve Sjogren and Rusty Geverdt namely, and they reject some voices that attempt to steer them away from their God-directed courses. I mean, who hasn’t received a phone call out of the blue from some “prophetic” caller pronouncing words that clash with someone else’s prophetic leading? Been there, done that. All the words, dreams, infillings, and circumstances that seem too good to be circumstance land the Bohlenders at Kansas City’s International House of Prayer and their eventual founding of a Christian adoption organization. Oh, and the church they planted back in Cincinnati withered and died, hence the title. Now, I’m going to tie this story with The Big Lebowski. Because it’s obvious, right? Probably the most beloved film in the Coen Brothers’ Oscar-filled arsenal is The Big Lebowski. Aging stoner and White Russian-quaffer Jeff “The Dude” Lebowski finds two thugs in his home who, in the aftermath of a shakedown for cash, promptly take a leak on his rug, a favorite household item that “really ties the room together.” Seems the thugs confused this Lebowski for another Jeffrey Lebowski, a wealthy one, who has a pornstar wife gone missing, presumably kidnapped. While trying unsuccessfully to get recompense for his ruined rug, The Dude encounters a panoply of weirdos consisting of anarchists, pretentious artists, criminals, and denizens of a bowling alley, that sport serving as a metaphor for life. The slacker Dude stumbles from one bizarre scene to another, hoping against hope that something positive might go his way regarding his rug. In between, he sires a child, buries a friend, and tries to make sense of this nonsense as he’s swept from one odd happening to the next. Helping him to cope is a cowboy who drops in now and then to comment on the proceedings, because, hey, every mythic story needs its oracle. I know it may seem strange, but I see Bohlender’s story and The Dude’s as linked. Recently, I had lunch with a friend, and as we discussed the vicissitudes of life as 50-something white guys in America, he stated that the world we live in now may be God’s best possible outcome. I wondered then if it was best for the whole of the world at the expense of being the best for any one of us in it, and I still wonder that. God may very well sovereignly make the best that can be made of this sin-sick world, but what does that mean in the lives of you and me? To fill the gaps and to make that “best world” happen, does it come at the expense (as God may require) of individuals who may or may not live their “best life now”–as Joel Osteen calls it? We have this tendency to think that God is always working His best in our lives, but are we the focus? Or is the world the focus? When we attempt to look at another’s life and draw conclusions from it, what can we really know? And does being a Spirit-filled Christian mean that we can make any greater sense of the direction of our lives compared with someone who isn’t Spirit-filled? As a Christian, I believe God leads. But what happens when He leads and the outcome is not only unexpected but downright bad–or at least bad on the surface? And what if it’s not just bad on the surface but terrible no matter which layer you examine? Bohlender paints a picture of guidance by the Spirit that seems wonderful and freeing in close-up, but when you stand back and look at the big picture, it seems no better than the random vicissitudes of life. Is that how God works? Is this His “mysterious ways” we always hear about? And how is this any different than the story of The Dude, who somehow ends up okay in the end, if not exactly in the outcome he expects? What separates the drifting pothead seeking nothing more than to get through another day from the ardent Christian seeking guidance to change the world? Now true, one is fictional and the other not, but when we survey the lives of people, Christian or heathen, fact and fiction converge. I believe my friend is right about this world being the best possible world God can make given mankind’s fallenness. What that means for what you and I experience of it individually–well, that’s much harder to grok. Some seem destined for greatness, while others get ground up in the gears, and it’s not always clear which camp they belong to. All I know is a Christian knows that somehow it’s all in preparation for when this life is done, and sometimes the when, how, and why won’t make any sense this side of heaven. When the economy cratered a few years back, resulting in an unforeseen layoff, Barry spent day after day looking for work. Turned it into a job like everyone said he should. But if Barry’s new job of looking for a job was any indication, he would have enjoyed a more lucrative career selling water on the moon. Barry was a Christian, as was his wife, Karen, and their daughter, Krysta. None of them understood why God would make it so hard for a humble, talented man like Barry to support his family. In time, the job hunt was supplemented with plenty of book-reading and music-listening. Barry fell in love with the bravura passages of little-known author Guy Ames. In fact, that admiration for Ames convinced Barry to try his own hand at writing a novel. He entitled it Unfinished Business. After five years of unemployment, in which Barry did anything he could find to bring in money, he hit the motherload. A high school buddy he had not talked with in over 20 years called him out of the blue after Googling him. Jim, who owned a growing company, had just become a Christian, and after praying one night, felt compelled to ask what had happened to Barry. The Internet told Jim what he wanted to know, and he wanted the esoteric skills Barry had. In fact, he offered his old friend twice as much money as Barry had ever made. But the job wouldn’t start for six weeks. Having been miserly for years, Barry decided to do something to celebrate. Guy Ames was speaking at a small writing conference in San Diego. Barry thought he’d kill a bunch of birds with one small stone, so he called the conference leaders and found that a few spaces still existed. Barry snapped up one, bought a plane ticket, reserved a hotel room, and worked up an elevator pitch for Unfinished Business. When he announced that he was making this small personal pilgrimage, his wife was happy for him. She had a fear of flying, so she wasn’t interested in going, but Krysta read a brochure on the conference and saw one of her favorite authors was attending too. Soon, the trip was a dad and daughter thing. Given that Krysta was getting married in a few months, both she and her dad considered it one last dad-daughter event before another man became more important in her life. The night before their departure, Krysta heard a voice. Over the past six months, she had increasingly heard what sounded like a voice, but this time the voice said something that sounded like real words: Don’t go on that trip. Krysta was terrified. The feeling of dread was so strong, she barely slept a wink all night in her apartment–except when she finally dropped off an hour before she was supposed to get up for her flight. Barry forgot to call over to Krysta’s place just before he left, and when he arrived at the airport, he found he had also forgotten to charge his cell phone AND he left the charger back on the counter in the kitchen. Still, Krysta’s roommates, some of her old sorority sisters from college, were ultradependable, so Barry knew Krysta wouldn’t be too late because the girls wouldn’t allow it. But when an elderly lady on standby looked like she was going to be bumped, Barry thought he’d be a gentleman and let her take his place. Krysta was obviously delayed, and catching the later flight made sense. Barry surrendered his seat. The airlines promised they’d move him up to first class, Krysta too. Krysta never made it to the airport, though. She missed an exit, and ended up stuck in the aftermath gridlock caused by a semi rollover on the highway. Barry wasn’t sure what was happening with Krysta, but hearing one of his favorite bands blaring from the headphones of the young man sitting next to him told he should get on that plane and let Krysta figure it out. She was a big girl and could fix her own problems. Fly like an eagle, to the sea. Barry was going to see that band when he got back. He already had the tickets; a second gift, but this time one Karen would like too. Just 12 minutes before it was to land, Barry’s plane took a lightning strike to an engine. Normally, the lightning arrestor worked fine, but it had been replaced and reattached incorrectly by a mechanic. At the inquest, it came out that the mechanic had been up late partying after attending a rock concert, one given by the band Barry would never live to hear. The engine caught fire, and the wing of the plane lost integrity. The plane went down just off the coast of California, all 113 aboard perishing. In the aftermath, Krysta told her mother about the voice, and they both held each other for a long time, stunned. Krysta’s fiancé called it a miracle. Karen and Kyrsta didn’t feel that was the best choice of words. Still, when she spoke at her father’s memorial service, Krysta found herself using that word too. Guy Ames had to cancel his appearance at the workshop due to a ruptured appendix. He later felt that brush with death was a wake-up call. Four months of healing later, he took his meager book earnings and launched a small software firm that Google bought, ensuring he never had to worry about money again. He never wrote anything else. Just 11 days before her wedding, Krysta came down with what felt like the flu. At least that’s what the doctor told her. She stayed in bed to try to rest up, and that was where her roommates found her, dead. The autopsy showed a large, fast-growing brain tumor. She was 23. One of Krysta’s roommates was so touched by what happened, the only way she could deal with it was through song. She and the other roommates formed a band and recorded the song. “Then She Was Gone” was a minor hit online, and the band Scarlet Queens, enjoyed the peculiarity of being an all-female death metal band, though they never made it big and folded a couple years later. Life wasn’t good for the survivor. Like her daughter, Karen crawled into bed and stayed there. During her self-imposed beddedness, she could not keep her eyes off a pile of paper on Barry’s dresser. It was the manuscript for Unfinished Business–unfinished. Karen had never read one word of it. On the 29th day of her exile, she took the manuscript down and spent the rest of the day lost in it. She admitted that this was a side of Barry she had never seen. The novel was actually superb, with deft characterizations and a killer story about an author who burns his writing career to the ground to start a software company that eventually grosses him a fortune. The novel had all the trappings of one of those mystical crossovers into the business book genre, filled with down-homey aphorisms about life, the corporate world, and spirituality. And Karen smelled money. Heaven knows Barry didn’t leave her anything. Karen, who had not even an iota of creative authoring skill, was nonetheless a sharp-eyed editor. She tightened the narrative and found a publisher on just her fourth query letter. Unfinished Business became a publishing phenomenon, with some claiming it changed their lives, and Karen became a wealthy woman. She also became the target of every guy who could get her number. After one lothario took her for a couple million, she withdrew from public life. Money didn’t buy happiness, and loneliness ate at her soul. She missed her daughter and husband dreadfully. That weight turned to bitterness, and somewhere along the way, Karen and God parted ways. So much so, that when she died of lupus a few years later, she left the estate to American Atheists for a Better Tomorrow. Now, what does that story say about God? About his sovereignty? About the work of the Enemy? About the mysteries of life? How is it that the good fortune Barry received set in motion events that led to his death? Did God cause the lightning strike? Or the Enemy? Or dumb luck? Why did Barry’s act of kindness end in his death? And wouldn’t it have been more “fair” for the elderly woman to die instead? And what about the pointlessness of it all, with the writer Barry flew to see canceling? How is it that Barry wrote a book that mirrored that writer’s future life? What is the point of Krysta avoiding the plane crash only to die a few weeks later? And how can God allow all this to end in a huge wad of cash going to an atheist organization? If you’re a Christian reading that story, no doubt you started to make connections. You tried to find some redemptive thread in it all, because that’s what we seem obsessed with: Making sense of life. But what if there is no sense to be had in that story? In the American Church today, we fall prey to a compulsion to find meaning in everything. If something doesn’t make sense on the surface, we have to make it make sense. I think this is dangerous; it borders on divination. That divination danger does scare some Christians, so much so that they flee in the opposite direction. To avoid being seen as crystal-ball gazers, even remotely, they chicken out of showing any faith. Over at the normally reliable Parchment & Pen blog, C. Michael Patton shows us what happens when Christians blanch in the face of dealing with the vicissitudes of life and how we view God. In “Will God Protect My Children?” Patton has patiently nursed a redemptive relationship with a lost soul, but when that man asks the eponymous question, Patton rolls over and plays dead. We have a case here of conflating the mistake of trying to scry sense out of life’s odd twists and turns with giving into the fear that we might be forced to explain God’s seeming lack of love for us when something goes wrong. Can we make sense of everything in life? No. But can we trust God to make sense in Himself? We must. Anything else is not faith. 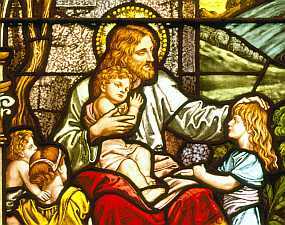 At some point we must be able to say to that lost man that God does in fact protect our children and we must trust Him for that. Patton says the Scriptures don’t promise anything, but is that true? That’s either true or it isn’t. If you’re a Christian, you know which it must be. The story of Barry, his family, and the others who swirl around them told above is true–in a way. It contains bits and pieces of stories cobbled together. Regardless of its truth as a whole, the fact remains that it could be anyone’s story. We all have stories of strange coincidences and odd events that happen in life, sometimes lengthy ones. Our issue is when we attempt to draw any conclusions from those events and to create a supernatural narrative from them. The fact is, we just can’t. Unless we have some direct revelation from God that explains everything, 99.99% of the time we’re going to get the explanation wrong. We’re not God, and we are too limited to know how every piece fits together and for what reason. God help us if that’s where we’re heading in the American Church today. When I was the age my son is now, the original Star Trek was still on first-run TV. I actually remember my father watching the show. However, when I asked to join him, he told me that Star Trek was “too scary for seven-year-old boys.” That, of course, only pushed me more to want to watch it. In a way, that show became the ultimate forbidden fruit of my childhood. When Decker mouths those final lines, I find them some of the most chilling in all of television. Decker’s “Don’t you think I know that?” stands as the frantic wail of a man who did everything by the book, drew on every command principle he’d been taught, stuck to the rules passed down from leader to leader, and yet none of that wisdom was good enough in the end. Events conspired against him and wound up destroying his crew—and ultimately the Commodore himself. One clear decision goes awry, morphing into a nightmare that can never be undone. Recently, I read the bestsellers The Black Swan and Fooled by Randomness by Nassim Nicholas Taleb. In them, Taleb forges a convincing argument that none of today’s leaders got to their positions of leadership through any other factor than chance. The difference between the corporate mailroom clerk and the CEO may have come down to nothing more than getting stuck in a traffic jam in the wrong place at the wrong time. Yet the CEO goes on to write a bestselling book telling how his “wisdom” won him the corner office, while the mailroom clerk labors forgotten, his aspirations forever on hold. I know too many mailroom clerks, though. Too many good people who fell prey to the Commodore Decker Conundrum. They did everything they were supposed to do, but it wasn’t good enough. They were undone by the greatest doomsday machine of all: rotten luck. In other words, you may do it all right and yet still fail for reasons outside of your control. Just like Commodore Decker. You may try to recover, but chance so dashed your jigsaw puzzle and trashed its pieces that the final image is irretrievably lost. Chance is quite a difficult concept to grasp in the Kingdom of God. Some Christians would say that chance doesn’t exist as God is control of our every action. 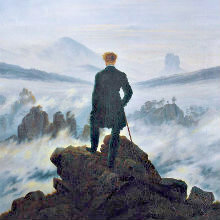 Others argue for chance’s reality; how else to explain why some godly endeavors fail? A friend of mine once told the story of a teen who lived in his hometown who felt the call of God to work as a missionary in Africa. That young woman spent several summers raising money to preach the Gospel to lost Africans. Hers was a burning desire, and everyone who knew her understood her cause was smiled upon by the Lord. One day, she boarded that plane and found herself in Africa, the fulfillment of all that hard work and desire. That young, bright star of a missionary died later that week from some virulent disease she picked up while traveling. I’m not sure I understand what happened to that young woman. Was she a victim of chance? Did she simply sit next to the wrong fellow passenger, one who harbored the disease that would ultimately take her life before she had the opportunity to share Christ with even one African? Certainly God knew that she would die, her mission unfulfilled. Still, the why of it haunts the survivors. I don’t know the answer to the Commodore Decker Conundrum. I’m not sure I know what to say to those Christians who do it all right by the Book, but then everything seems to go wrong. While none of us can see what is happening behind the curtain, I know that I don’t like to think that chance enters into the equation at all. Yet Ecclesiastes 9:11 says otherwise. I look around and I see too many Deckers out there, solid people who did all the right things and yet were crushed by happenstance. More than anything, I want to know what to say to them. I never find the right words, though. Romans 8:28 stands as the counter to Ecclesiastes 9:11, but smarter Christians must know how to reconcile the two. When I hear the stories of men and women who made decisions they still pay for every day of their lives, decisions that seemed in keeping with the prevailing Christian wisdom yet have put them in desperate positions, I’m at a total loss—as if staring into the unrelenting maw of a doomsday machine.